From China's People's Daily Online. U.S. President Barack Obama said in Tokyo Saturday that a strong and prosperous China can be a source of strength for all nations and the United States does not want to contain China. "No one nation can meet the challenges of the 21st century on its own. We welcome China's appearance on the world stage," the president said while delivering his Asian policy speech in Tokyo. "The U.S. does not seek to contain China... the rise of a strong and prosperous China can be a source of strength for the community of nations," said Obama. The U.S. president did say his country will deal with China with its own interests in mind, but it is precisely for this reason that it is important to cooperate with China on issues of common concern, as "the United States and China will both be better off if we meet them (the challenges of 21st century) together." In the speech, Obama praised China's engagement in world issues of Afghanistan, Pakistan and the Korean Peninsula and vowed to work to deepen strategic and economic dialogues with Beijing and improve communication between the militaries. He also denied a deeper relation with China means weakening of bilateral relations with Japan. 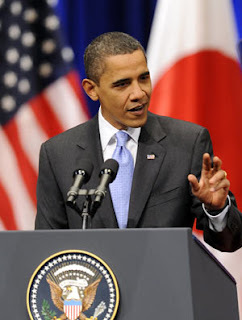 Obama declared his nation will aim to sustain leadership in Asia while working in tandem with nations such as China. "In an interconnected world, power does not need to be not a zero-sum game. Nations need not fear of the success of another. By cultivating spheres of cooperation, not competing in spheres of influence, will lead to progress in the Asia Pacific," he said. "As America's first Pacific president, I promise you that this pacific nation will strengthen and sustain our leadership in this part of the world," said Obama, referring to the future role he hopes the United States will play in the region. Obama's speech was met with rapturous applause from a large audience of Japanese and Americans who had come to hear the leader speak shortly before he headed off to Singapore for a summit of ASEAN nations to be held in Singapore. More proof that Obamasiah is more than a couple of fries short of a Happy Meal. Sounds just like John Key and the rest of the free-trade zealots.